AJ Dillon burst onto the scene in 2017, and has only piled onto his resume ever since. The Eagles last year started the season 2-4 in their first six games. They averaged only 16 points per game in that span. The teams they beat were Central Michigan and Northern Illinois, while they lost to were Virginia Tech, Wake Forest, Clemson, and Notre Dame. The season started with everyone thinking Boston College is the same team as the past few years. However, this was not true. After that 2-4 start, Eagles’ head coach Steve Addazio made AJ Dillon the starting running back against Louisville. This proved to be one of the smartest coaching decisions of the year in all of college football. In AJ Dillon’s first start in his college football career he put up 272 rush yards, and four TDs as the Eagles beat Louisville 45-42 for their first conference win in two years. Dillon disrespected the Cardinals defense many times, but a 75 yard touchdown really opened a lot of eyes. Dillon would not stop there, though. Over the span of three weeks against all conference opponents (Virginia, Florida ST, NC ST) Dillon racked up 434 yards and two TDs. The Eagles were 2-1 in those three games. His 2017 campaign concluded in a bowl loss to Iowa, where he had 157 rush yards and one TD. Dillon finished the year with 1,589 rush yards and 14 rushing TD in only six starts. When the Eagles started Dillon last year they were 5-2 with an average of 33.7 points per game. 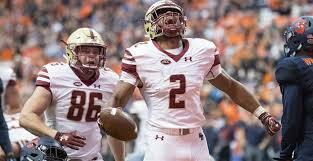 AJ Dillon won ACC Freshman of the Year for his 2017 performance, and was the first Eagles player to win that award. AJ Dillon has kept the hype train alive through three games this season. In his first game of the year against UMass, Dillon only played in the first half where he had 98 yards. Against Holy Cross, Dillon only had six carries. However, in those rushes Dillon racked up 149 yards and three TDs, which is absolutely insane production. His first real test of the year came against Wake Forest. Before this game against the Eagles, Wake Forest was 2-0. The Demon Deacons wanted to crush Dillon’s Heisman hopes, but they could not. Dillon had 185 yards and one TD en route to a 41-34 inter-conference win. So far in the 2018 campaign, Dillon has 432 rushing yards and four TDs. Dillon is a very powerful and exciting running back. Even though he was not ranked to win the Heisman before the season started according to bookmakers, he is now at 40/1 odds to win the award. 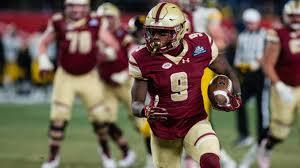 If he can keep this up, Boston College will be very competitive at the top, and he might win the Heisman.